"There they are! Don't you see them? EVIL, pure and simple from the 8th dimension! Get them!!" I can think of few big-budget films made in the 1980s that went quite so off the beaten path as the deliriously bizarre and extremely daring Adventures Of Buckaroo Banzai Across The 8th Dimension. Writer Earl Mac Rauch and director W.D. Richter set out to create a modern day pulp-fiction hero. Not simply someone one-dimensional, like Indiana Jones, but a character that could wear many hats and carry many franchises. The end result was a rather farcical and satirical idea; re-creating the atmosphere of a classic comic like Doc Savage but doing it in such a way that mocked modern sci-fi culture as well. Though most don't know it, they succeeded in ways probably never imagined, with Buckaroo Banzai gaining tremendous respect from fans, and possibly one of the most devoted cult audiences next to The Rocky Horror Picture Show. It has long stood as one of my favorite films and, even though it's aged badly, I don't see that changing anytime soon. Half American and Half Japanese, scientist Buckaroo Banzai (Peter Weller) leads the field in research into unusual and ignored sciences. Not content to stop there, though, his team of friends (from all walks of life) also wander the country in their tour bus as the rock 'n' roll band The Hong Kong Cavaliers. While topping the charts, the Cavaliers also keep an eye on the world situation from their tour bus, always willing to spring into action if a problem, criminal or otherwise, arises. They're helped by a network of voluntary crime fighters around the nation known as the Blue Blazer Regulars and Irregulars. As our story begins, Buckaroo Banzai is testing out his new jet-car, designed to travel at supersonic speeds across the ground. Unknown to those outside his circle, though, is that he intends to test the "Oscillation Overthruster," a device which will allow the car to travel through solid rock, unharmed. The device is a success, making Banzai the first man to pass through solid matter; the downside is to do it, he had to travel through the 8th dimension to do so. Though he doesn't know it, he's exposed to a race of evil aliens known as Red Lectroids, most of whom are imprisoned in the 8th dimension. The good Black Lectroids from Planet 10 contact Banzai and warn him that his invention may unleash a great evil upon the universe, as led by the sinister Lord John Whorfin (John Lithgow), a Red Lectroid stuck on Earth with his cronies, who desires to use an Oscillation Overthruster to free other evil Lectroids in the 8th dimension. Team Banzai must prevent this science from falling into the Lord's hands, but doing so won't be easy. Thankfully he has help from strange places. Like any good sci-fi serial, the audience is given minimal information about what's going on, and is expected to just simply 'play along' with it. Once you accept Buckaroo Banzai as one of Earth's greatest heroes (after all, he has a comic book made about him), you're just along for the ride; business as usual saving the planet from evil. Obviously, the idea was to drop viewers into the film as if Banzai was a well-known figure in an attempt to ready-make a new Flash Gordon or Buck Rogers. At the same time, though, Buckaroo Banzai also makes fun of the serial genre it mimics so well. Thank to its wild and largely senseless plot, it's a mountain of utter sillyness, and plays out that way to the last. It works, though, thanks mostly because the producers actually dared to support the film, giving it a generous budget and an opportunity at looking like something other than a low-budget parody. With earnest support comes a great cast as well, and Buckaroo Banzai has a superb collection of faces, especially on the villains-side. Not only is John Lithgow's over-the-top performance as alien leader John Whorfin memorable, but more so because he's backed by Christopher Lloyd, Dan Hedaya, and Vincent Schiavelli (more recognizable by face than name). The Hong Kong Cavaliers themselves are mainly a product of 1980s' fashion, but it seems strangely fitting even today. I would imagine Buckaroo Banzai falls squarely into the category of "love it or hate it." The demented and often confusing storyline, while meant to be humorous, might lose some people. Jokes will either fall flat or hit that mark that will endear the film to you. In a sense, I think writer Earl Mac Rauch and director W.D. Richter were aiming for the sci-fi fans, trying to bring them something that made fun of their favorite genre while also creating the foundation for a hero that everyone could easily get behind. I think they had an understanding of the 'cult' fan; the movie-goer who can appreciate a film just for being fun rather than an artistic triumph. The ultimate, failed development of the promised sequel, Buckaroo Banzai Against The World Crime League was, in my opinion, a real loss, because there was so much to build on. We've seen something of a resurgence of the serial-style film what with franchises like the latest Star Wars, the Mummy films, and now, The Lord Of The Rings trilogy, but none of them are intended to also be funny by way of mocking themselves or their genres. I say, we need to bring Buckaroo Banzai back. One adventure, even into the 8th dimension, is simply not enough. Image Transfer Review: Finally, Banzai comes home widescreened at 2:35:1 legally for the first time (bootleg copies have circulated). The transfer itself is amazing, easily surpassing any fan's expectation for the movie. While many of the source flaws that have been in all versions are present (occasional color fading, heavy grain, some speckles), it all looks great thanks to a very smooth, natural transfer that is near-flawless in terms of digital compression, but doesn't try and make up for source flaws with exaggerated effects like over-sharpening. I'd rather see print flaws and softness than having things made worse by trying to over-correct. If I had any complaint, and it would be simply a fan's nitpick, it would be that the movie could have used some slight improvement in the telecine process to correct the faded parts and blurred color schemes (mainly the opening credits sequence). The extended opening sequence is of slightly less quality, but it doesn't matter since 90% of it is supposed to be old, 8mm footage from the 1950s, not intended to look good anyway. Rest assured, though, the transition to DVD has been kind to Buckaroo. Audio Transfer Review: The new Dolby 5.1 sound mix is pleasing and very fitting for the film. It expands thesoundfield and ambience of most of movie without being too little or too much. Surrounds are used for a lot of echo effects and directional material, but not too heavily. The front speakers carry most of the film with good directionality and a nice, theatrical tone. The musical score (in all its 1980s' synth-pop glory) is given quite a boost, but it doesn't overtake the dialogue and sound effects, which remain inl balance. It sounds like I remember it from the zillions of times I've seen it, but now with a nice, clean sound quality that allows it to sound bold and active, without distortions or frequency drop-outs. If you want to hear the French dialogue, you're stuck with a very flat mono audio track that really doesn't even come close to the tone of the 5.1 audio. 1 Other Trailer(s) featuring Promotional Buckaroo Banzai: Ancient Secrets and New Mysteries trailer. Numerous photo and conceptual art galleries along with photos of film props. Extras Review: This special edition of Buckaroo Banzai is the presentation fans have been anticipating and more, with a number of great supplements. It needs to mentioned, right off the bat, that the entire disc, as well as the supplements (and the director and writer), all treat Buckaroo Banzai as a docudrama of real events surrounding the real-life exploits of Team Banzai and the Banzai Institute. This is the running joke and it's never broken; for all intents and purposes, this is a movie depicting real events. The film itself has two significant features: a commentary track by W.D. Richter and Earl Mac Rauch, and a subtitle commentary entitled "Pinky Carruthers' Unknown Facts." The filmmaker commentary is a lot of fun and is worth listening to for a wealth of factoids about the movie. Of course, Earl Mac Rauch is actually playing Reno Nevada, the real-life comrade of Buckaroo Banzai, willing to come forward with information about the inner workings of Team Banzai. Whenever the writing is discussed, Rauch is mentioned as if he really isn't there. This whole joke of Team Banzai really existing may be hard to get used to, but works out for the best, offering one of the most unique and funny commentaries I've heard. At no point do either of the men tip their hand or get goofy about the attitude they're taking; they stay dead serious. They discuss how top secret documents were given to them, allowing them to model props and sets close to the actual places used by Buckaroo Banzai and other details such as that. Don't worry though, there's a lot of true-to-life anecdotes and information about the filmmaking process and the actors. The subtitle track is supposed to have been written by Pinky Carruthers, Banzai's head of security. Given that he knows so much about the world of Banzai, the subtitle track is a series of bizarre little trivia (most of which is fictional) about the making of the film and the real world of Banzai, as when Buckaroo really broke into the 8th dimension, he did so accompanied by Albert Einstien's brain in the jet-car with him. The documentary, Buckaroo Banzai Declassified (running at around 20-25minutes, there is no time indexing), is mostly interview footage with director W.D.Richter, who is inside the Banzai Institute. The program begins with some interviewstaken from the time of the film's release, but after a few minutes, it becomes solelyRichter's affair, and is a brand new interview. 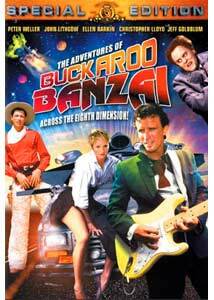 It's a welcome addition to the disc, butRichter fails to go into any detail on why the Banzai sequel (Buckaroo Banzai Against The World Crime League) never materialized or what happened to the development of the Banzai television series. Fans of Banzai might know these answers, but more casual observers will obviously ask this question, so I'm surprised it's not answered. Understandably, he may not be able to legally comment, but it's still left as too open an issue. That aside, it's a good, capsulized story of the making of the film. 14 deleted scenes, from the original workprint, are presented. To be honest, none of them are particularly amazing and are typically dialogue extensions of scenes cut-short. They are not anamorphic, but are widescreened and mixed into their respective scenes from the new print. Their quality is pretty low, though, coming from a second generation dub of the original workprint, according to W.D. Richter. The most important facet in the scenes is the few times that Hanoi Xan (the leader of the World Crime League in Buckaroo Banzai lore) was originally mentioned in the movie, but removed because Hanoi Xan is more a serious character, not fitting well into the pure humor of Across The 8th Dimension. Some of the scenes don't work too well with the film's flow, so it's obvious why they were taken out. A few of the simpler jokes would have worked well, though, my personal favorite being a brief explanation of why John Gomez is holding the battery in the van-driving sequence. There is a detailed (fictional) bio for Buckaroo Banzai as well as bios for all of thecharacters. Again, keeping in mind the running joke of the disc, there are no references to the actors themselves and as such, there are no bios or filmographies for them. There is an extremely large photo gallery featuring stills from the film categorized by character and/or scene. It's quite extensive, and will produce zillions of fan-made desktop images. The "Jet-Car All Access" area is simply some technical information and details on the Jet Car from the film, which was actually a real, functioning, vehicle designed by a team of jet-engine dragster designers. The Banzai Institutes Archives section is another hefty dose of various photos anddrawings, this time for props and promotional materials. For example, the album covers for all of the Hong Kong Cavalier CDs (this is great, by the way). Also included are text documents, many of which make interesting reading, like Professor Hikita's diary or an interview with Buckaroo Banzai. There's photos of tie-ins (like the Commodore 64 computer game which I fondly remember playing, yet never beating) and a radio interview with one of the publicists for the film. Also included are two reviews of the film from the Hollywood Reporter and the New York Times. Rounding off the features is the original trailer as well as the computer animated,promotional teaser for the Buckaroo Banzai television series Ancient Secrets and New Mysteries which was originally to begin filming and airing this year, but obviously something prevented that, at least for now. There are also special features for DVD players that feature the NUON enhanced chip (on certain Toshiba models), but not owning a NUON, I was unable to access them and the disc does not even say what they are. I did manage to locate a few easter eggs amongst the menus, and if you want to spot them yourself, please stop reading at this point, avert your eyes, blindfold yourself, etc. On the first menu of deleted scenes there is a watermelon in the lower left-hand corner of the screen. Highlight it and click on it to uncover a text article about Banzai Institute's experimentation with watermelons (an in-joke for fans of the film). On the second page of this document, there is a Team Banzai logo in the lower right-hand side of the screen. Click that and you get a brief, funny interview clip with W.D. Richter on the subject of watermelons. When you go into the Banzai Institute Archives section of the disc, right on the initial menu there is a team Banzai logo in the lower right-hand corner. Click that and you'll get a quick gallery of alternate ideas for the DVD cover (neither of which is very good, in my opinion). I'm sad to see the original cover art go, but at least you can get a look at it in the tie-in photographs by looking at the original Vestron Video VHS box (and Laserdisc). The new cover art is a little too wild for my tastes, but all that aside, this is a marvelous special edition. None of the features are filler, and all of them really fit well with the theme of the movie. Instead of recycling extras that may have floated around back in 1984, all of this newly produced material is a sight for sore B. Banzai fans' eyes. Buckaroo Banzai is a movie that largely succeeds because it never gets serious. As an examined film, it's really not all that great, and it has major problemswith pacing and organization. It's impossible to let any of this get to me, though, because it's such a peculiar, unique piece of work. It wants to desperately break the mold, but instead, it just makes another mold for itself. If there is a dictionary with the term 'cult movie' in it, there should be a picture of Buckaroo Banzai's cover right next to it, as it literally lives up to a textbook definition of such a project. It's been a long road, but those of us who would do things as stupid as wearing Team Banzai patches on our jackets or hats are finally getting our due by way of this great special edition. The Banzai Institute did a great job putting it together but, unfortunately, they've been tight-lipped about any secrets going on behind the walls of Complex 88. I'm confident they will be monitoring this transmission, though.